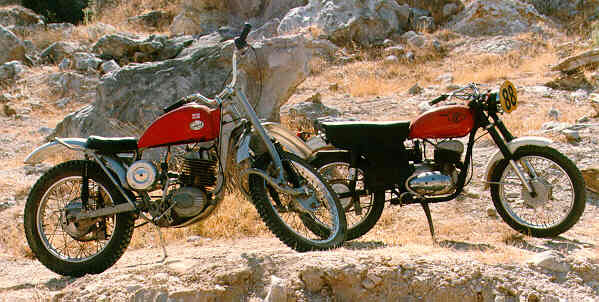 Many consider air-cooled twin shock vintage trials. Within the vintage trials context, they are capable to compete in. They are well suited for trail and play riding, but due to spare parts availability and collector desirability, the prices tend to be close to a modern used bike. Example: a '70s TL125 range from ~$900-$2500; Early '90's Beta ~$1500-$2000; and a 2005 model $2500-$3500. Prices tend to be significantly higher in the East and West Coast compared to the Mid-West and Rockies. The most popular vintage trials bikes with a solid parts support network are the Yamaha TY, Honda TL, and possibly the Bultaco Sherpa T or Montesa Cota. Visit: http://www.bjracing.com/vintrials.html; http://amsracing.com/amsracing.com/ or http://www.smproducts.co.uk/. The 1965 Bultaco Sherpa revolutionized the sport with the introduction of the 2-stroke; the next major development was the 1970Honda TL250 Sammy Miller prototype..
Monoshock models from the 80's and early 90's such as the Fantic 301/302/303/304/305/307/K-Roo, Aprilia Climber, Beta TR32/33/34/35/Zero/Synth/Gara are generally dificult to find parts for as they have an even smaller following than the 70's era trials bikes. They often have drum brakes, cable operated clutches, no reed valves. They feel relatively heavy and often have peaky powerbands. Notice the evolution where the seat diminishes from the '70; and is non-existent in the '90s models. The older heavier models are more suited to trail/play riding. 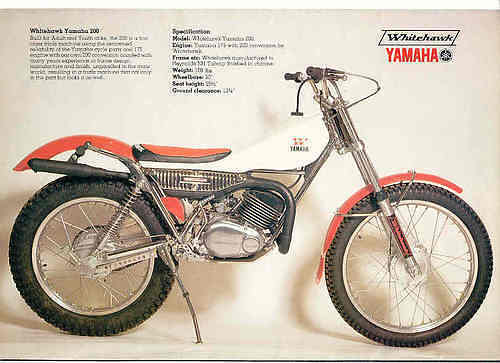 Unfortunately vintage trials bikes often cost as much or more than used 'modern' trials bikes. Let's define modern... liquid cooled, disc brakes, reed intake or 4-stroke, mono-shock. Many new riders make the mistake of selecting a 270 or 290 as a first bike - that's a lot of bike for a novice: the 270/290 spin up and hit hard to suit expert riders clearing 8' obstacles. Surpisingly the torquey 300 spools up slower, and has a very linear powerband. These 'big-bore' engines with high-compression and low exhaust port height can be a challenge to kickstart. Experienced riders consider a 200 as an ideal first bike, which is relatively easy to start. The only current model offered is the Beta Evo 200. The Sherco ST 2.0 was made from 1999-2009. We're fortunate to own a GasGas TXT Pro (Discontinued after 2006). 200 are in high demand and fetch a premium price. The 125 is a youth model and a great way to start: but hard to find and demand top price. Although a 200 weighs almost the same as a 125, the 125 feels lighter to ride... flywheel effect? A 225cc overbore kit for 125cc bikes is available. GasGas, Spain has the largest market share and parts availability. I've heard that GasGas with 60%-80% market share, sells more trials bikes than the other 5 manufacturers combined. The current TXT Pro (TXII) model was introduced in 2002. The prior model TXT has roots in the Jordi Tarres developed the 1994 to 2004 JT/JTR/JTX/TX/TXT/'Edition' model lineage. The engine, chassis, and suspension components were essentially unchanged over the 10-year production. Changes were incremental but not revolutionary: plastics, fueltank, subframe/airbox, wheel hubs, and front brake calipers. The engine was also used in the GasGas Pampera and is the foundation of GasGas EnduroCross models. The older, heavier engine design, adopted by Sherco, is bullet-proof. For this reason I own a 167.6 lbs. (Dry Weight) JT35 which is well suited for trail riding. Introduced in 2002, the GasGas Pro revolutionized engine design by shaving 17 lbs. from the motor and bringing modern trials bike to the sub 150 lbs. era. The Pro engine uses a diaphragm clutch similar to automobiles to reduce weight. The GasGas 'FOur-Six transmission' is a innovative design using 4-gears to provide 6 gear ratios; with 1st-4th close ratio for trials and 5th/6th wide-ratio for trail riding. Other manufacturers achieve weight reduction in chassis and engine materials.The 2003 Pro motor changed from aluminium cases to magnesium for a further 1.7 lbs. weight saving. GasGas used a color scheme to identify the different models up to 2006: Yellow 125cc/160cc/200cc Red 250c/280cc Blue 300cc. In 2002-2004 GasGas offered the "Edition" model which was the older TXT design and the TXT Pro. The first year (2002) release of the GasGas Pro engine had reliability issues in the new diaphragm clutch. These issues were addressed by 2004, but some still regard GasGas as less reliable than other manufacturers. A 2004 magnesium clutch cover upgrade with a design to improve cooling and clutch slave cylinder stroke was increased. The clutch cover upgrade is available for 2002 models. I believe the current quality is close between the 6 current manufacturers. Top of the line models use the Keihin PWK28 rather than the Dellorto PHBL 26. Chassis: In 2006 GasGas converted from the chromed oval steel frame to 2007/2008 black oval frames to reduce cost, 2009 to present models use round tube CrMo frames to further reduce manufacturing cost. Some look for the 2002 GasGas frame with a steeper head rake. The 2003 onward frame geometry between the Chrome or Black Oval tube frame, and the current round tube frame (Red, Gold, or Black) remained the same. I don't believe there was a deterioration in strength or durability with the GasGas chassis changes from 1991-2013. In 2010 GasGas followed Sherco's 2009 lead and offered a TXT280 Eco model that uses the 2008 black frame and a tube-type rear rim. Most trials rear tires are tubeless to run at 3-4 psi. Front tires still use tubes at 6-7 psi. Beta, Italy has a reputation of a quality build and promotes the aluminium frame. Current Beta's have roots in 7-time WTC Champion Dougie Lampkin development of the aluminium framed Beta Techno. The 1994-1999 Beta Techno was criticized for weak rear brake. Early model magnesium engine cases were prone to corrosion which resulted in coolant mixing with transmission oil. Front feels heavy compared to modern bikes: it's a 177 lbs bike! The Rev3 had some early issues with the stator. The carburetor is notorious for dripping fuel when on the sidestand for prolonged periods. GasGas and Sherco use the same Keihin PWK28 but don't have the same issue. Beta offers Rev4 4-stroke models 250 & 300. I personally do not like the Beta Left side kickstart. Beta turn tighter than a GasGas. As far as suspension: Most models over the past 20 years ran a 38mm Paioli RSD front fork with spring preload on one fork, and rebound dampening on the opposite fork. In 2004 GasGas switched to Marzocchi 40mm in the Pro model (also used by Ossa, Jotagas) which provided compression dampening in one fork, and rebound in the opposite fork, but Beta and Scorpa retained the older Paioli RSU 38mm. 2007+ Marzocchi are (black) aluminium tubes for a 2 lbs. weight reduction. Montesa uses Showa components. Rear shocks: Sachs and Paioli are usually rebound dampening only. Upgrades are availabe from Reiger, Ohlins, R16V. 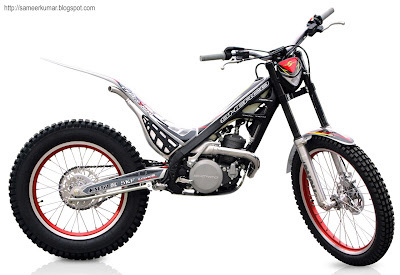 GasGas (2012), Jotagas, and Sherco have adopted the Formula 'Tech' Factory 39mm (5 Kg.) fork for the newest models. 1. Hydraulic Disc brakes (4-piston front, 2 piston rear) - AJP (Braktec), Formula (Sherco) GasGas used Formula in 2012 but returned to AJP in 2013. Some things that didn't work: USD forks (heavier, and tend to leak), Magnesium cases (corossion), Titanium fastener kits (to shave another 7 lbs. - none were ever sold by GasGas USA), Beta used a no linkage rear suspension from 2000-2008 on the Rev3/Rev4 - similar to KTM PDS. Although providing weight savings, Beta returned to linkage rear suspension on the Evo. Scorpa, France- declared bankruptcy in 2009. Yamaha supplied engines from 1998 sourced from the Yamaha TYZ. I haven't accepted the Scorpa fuel tank styling. Ossa, Spain - reentered the market in 2010 with the introduction of EFI 'reverse engine' (similar to Cannondale E440) and a 'casette' gearbox. LewisportUSA is the US importer. As expected the first year had EFI mapping issues which I've been told have been sorted out. The Ossa 280i only weighs 144 lbs. Jotagas, Spain - Founded by Jordi Tarres in 2009. Uses a unique rear suspension design coupled with Ohlins shock and Marzocchi forks. LewisportUSA is the US importer. 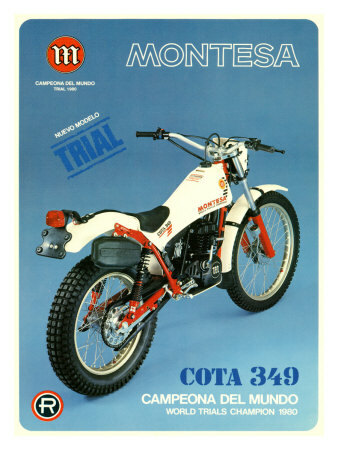 Montesa - Spanish subsidiary owned by HRC (Honda). Honda reliability. The Cota 315R (249cc) was offered 1997-2004, and the 4-stroke 4RT was introduced in 2005 reflecting Hondas departure from 2-stroke technology and promoted by 6-time WTC champion Toni Bou. 315R may suffer from clutch drag; and at a Dry Weight of 160.9 lbs. 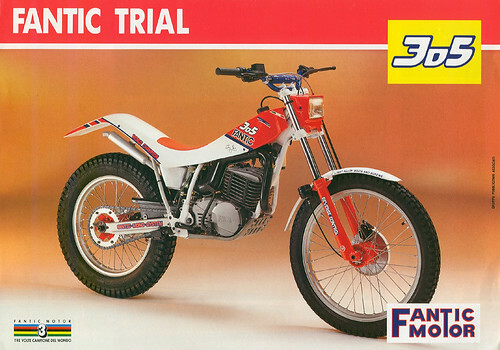 are heavier (particularly the 1997-2000) than the modern trials bikes. Adding a bit of ignition advance is a recommended mod. Clean models are highly sought after and command a premium price. Only slight changes over the model years. Montesa is not imported to the US due to a conflict with American Honda Motor Corp. Parts are available from LewisportUSA. Given a novice and intermediate riders capability: the rider won't be able to appreciate much difference between any 2004 or newer trials model. Best to purchase what you can afford, and Practice, Practice, Practice. CAVEAT EMPTOR: Some of the modern bikes in California were brought in from out -of-state and never registered in the DMV. If you don't have a title or bill of sale and MSO you may have difficulty getting registered (green or red sticker). Since thees bikes were originally manufactured to be street legal in Europe; but US DOT required removal of lighting equipment; if you have a Green Sticker and the 8th digit in the VIN is not a '3' or a 'C' there's a probability you can get CA street license plates. Last edited by seavoyage; 04-06-2013 at 07:51 PM.. The #1 Reason Manufacturers do not support 2-stroke development and do not import more 2-strokes into the US: Emissions. We really hope the new Ossa technology takes hold. Snowmobile manufacturers developed the 2-stroke technology to address high unburned hydrocarbon (UHC) emissions from carburated 2-strokes. The technology exists and is mature, and we hoped a mainstream European manufacturer like KTM/Husaberg/Husqvarna would take the initiative. Most of the European 2-stroke initiative is driven by the Trials manufacturers (GasGas, Sherco, Beta) that require light weight and torque. Emissions compliant 2-strokes would open a completely new alternative. If these Ossa EFI models do well in the USA it may be a harbinger of a viable market and the other manufacturers may quickly follow suit. It's interesting that the same dynamics affected the outboard motor and the snowmobile industry. There were four Ossa's at the PITS Frank Raines event. Very cool. I had the chance to catch up briefly with Adrian Lewis of LewisportUSA He is the US importer for Ossa, and recently brought in and sold most of his Ossa Explorer inventory. General opinion on riding the new Ossa: felt narrower and lighter than the GasGas. Shameless plug for LewisportUSA: Convince your local dealer to carry Ossa! We discussed Adrian's plans to import the Ossa 300i. In essence, each US State requires a significant financial investment for the permits for a vehicle manufacturer to sell their vehicles in the specific state, and be appropriately emissions compliant. This is the limiting factor, not the availability of the technology or vehicle models. If Ossa or any other vehicle manufacturer can not realize a Return of Investment (ROI) on their efforts to import into a State or Country; the effort isn't profitable and not worth pursuing. This is too cool: 2-stroke EFI running 120:1 premix ratios to meet EU emissions, but the key to the emissions compliance is fuel injection directly into the cylinder timed to enter the after exhaust port closure, most of the two-stroke emissions problem is solved. This is not feasible with carburetors. Strong F1 influence: The engine cants backward, Intake is in front, exhaust is behind the engine (a la Cannondale 440) and isn't vulnerably exposed. Cartridge gearbox. Crankshaft and conrod accessible from side. This category sizzles, Sweet Fantic . I was just in at Lewis Sports USA..They were uncrating the new Ossa's. OMG The Design Quantum Leap...Comes in two versions...Trials or normal seat. Cylinder lays back like the rear cylinder of a V twin. EXhaust out the back, Fuel injection intake at front. Lewis Sports can tweek the injection and the ignition to the riders style (or level), from a lap-top. Engine crank out the other side, after connecting rod is dis-connected. Last edited by seavoyage; 03-30-2013 at 09:23 PM..